Just a few things in this build. There's a lot of effort in the background for features for the future though! In the meantime, here's what you can see. Logging into the website through SSL has been enabled. Simply ensure that you use https://toepoke.co.uk when navigating to the website. Once I'm confident all is well, SSL will be turned on by default in the future. Since the launch of toepoke I've concerntrated on the design and functionality of the screens you see ever day. I'm sure you'll agree a redesign of the e-mails is well overdue! Issue when sorting venues by name in the directory. 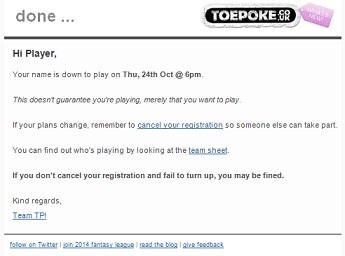 The website was sending the provisional sides e-mail out, even though nobody had put their name down! As an aside I'm intending to remove the provisional sides e-mail as I don't believe it offers much, and the intention is to give better support for managers for picking sides. An error would occur when sending the invitations out if all squad members had already registered.